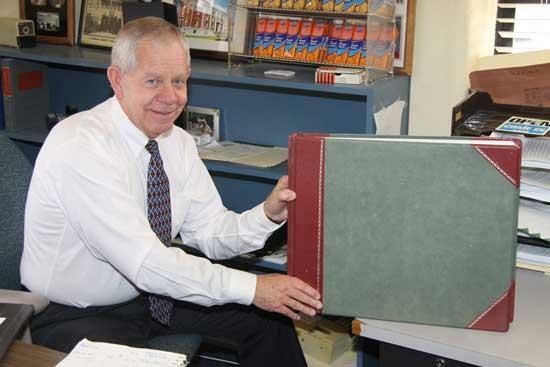 Cannon County Clerk and Master Harold Patrick shows his old system of keeping records Monday. His office is in the process of switching to computerized record-keeping. Cannon County Clerk and Master Harold Patrick "said goodbye to an old friend" last week. The friend in this instance is a cash journal he used to keep records of transactions for his court clerk's office. Beginning today, Patrick is using a new computer system supplied by the State of Tennessee to keep the records electronically. Patrick admits he doesn't have as much experience with computers as persons who may be a bit younger, but says he is beginning to get comfortable with the new system. "It's a big learning curve for me, but I am learning," he said. "My Achilles' heel is typing." Patrick said the major benefit of the new system is that it automatically calculates the breakdown of fees paid to the chancery court. "For example, in the past if there were a fine of $327.50, I would write it down in the journal and then have to break it down as to how much went to state litigation tax, court litigation tax, clerk's fee, data processing and so on," Patrick said. "Now, when we enter the amount into the computer, the program disperses the fees automatically. Patrick said the new system will also make it easier for his office to file monthly reports to the state. The computer is linked via the internet to the Tennessee Court Information System, or TnCIS. "They are having someone in our office for the entire month of March to help train Dana (Davenport, Patrick's assistant) and myself as they work to get all of the Clerk and Masters offices in the state online this year," Patrick said.